As of 2018, an estimated sixty-five percent of Americans have bad breath. Over forty-million Americans have "chronic halitosis," which is persistent bad breath. Research shows that about 90% of all bad breath (halitosis) is of oral origin (not systemic). Less than 10% of the time bad breath in not cause by neither digestive upsets nor metabolic diseases. Americans spend more than $1 billion a year on over the counter bad breath (halitosis) products, not knowing many of which are ineffective because they only mask the problem. The first treatment you should consider is tongue scraping and it's performed before or after you've finished brushing and flossing your teeth. Special implements are available for tongue scraping which you should be able to find easily at your local pharmacy. Simply place the implement as far back on your tongue as you can without stimulating the gag reflex and work the implement from side to side or back to front in a slow sweeping motion. After you're through scraping your tongue, put a small amount of toothpaste on your toothbrush and brush your tongue gently. One of the benefits of regular tongue scraping is that it can help combat the phenomenon known as "morning breath." Research published in the Journal of Applied Oral Science found that people with chronic morning breath tend to have more acidic saliva than other people, and this manifests in a thicker coating on the tongue. It's this coating that gives rise to that sour, unpleasant taste and smell. A proper oral hygiene routine not only includes brushing and flossing your teeth regularly but also cleaning your tongue. Tongue cleaning may seem strange at first but it's easy to integrate into your daily routine. The tongue's distinctive anatomy predisposes it to become a reservoir for harboring the types of bacteria that are responsible for about 90 percent of all bad breath. These bacteria are also implicated in dental decay and gum disease. Although most Americans are unfamiliar with cleaning their tongues, other cultures have been observing the practice for centuries. Most mouthwash, breath mints, and other products may mask bad breath temporarily but they won't prevent it because they are not addressing the underlying source of the bad breath (halitosis). If you want to ensure that your breath stays fresh, it's as important to take care of your tongue as it is to take care of every other part of your body. Bad breath, called halitosis, about 90% of the time results from poor dental health habits and about 10% or less of the time may be a sign of other health problems. Bad breath can also be made worse by the types of foods you eat and other unhealthy lifestyle habits. In general, bad breath is caused by a variety of factors. In most cases, it is caused by food remaining in the mouth - on the teeth, tongue, gums, and other structures, collecting bacteria. Dead and dying bacterial cells release a sulfur compound that gives your breath an unpleasant odor. Certain foods, such as garlic and onions, contribute to breath odor. Once the food is absorbed into the bloodstream, it is transferred to the lungs, where it is exhaled. Brushing, flossing, and mouthwash only mask the odor. Dieters sometimes develop unpleasant breath from fasting. Gum disease is caused by plaque - the sticky, often colorless, film of bacteria that constantly forms on teeth. Dry mouth or xerostomia may also cause bad breath due to decreased salivary flow. Saliva cleans your mouth and removes particles that may cause odor. Tobacco products cause bad breath, stain teeth, reduce your ability to taste foods and irritate your gum tissues. Less than 10% of the time, bad breath (halitosis) may also be a sign that you have a serious health problem, such as a respiratory tract infection, chronic sinusitis, postnasal drip, chronic bronchitis, diabetes, gastrointestinal disturbance, liver or kidney ailment. Bad breath may also be caused by medications you are taking, including central nervous system agents, anti-Parkinson drugs, antihistamines/decongestants, antipsychotics, anticholinergics, narcotics, anti-hypertensives, and anti-depressants. How to treat bad breath is important for people who suffer from it since chronic bad breath (halitosis) causes severe repercussions. Even know bad breath treatment products have spurred a billion-dollar industry, the most popular and best way on how to treat chronic bad breath (halitosis) is with toothbrushes and regular professional cleanings with dental hygienists. Toothbrushes cannot always reach the back of the tongue where the bacterial causes of bad breath reside; so although brushing plays an important role in oral hygiene, tongue scraping, together with proper oral hygiene is the most effective "common" treatment against the causes of halitosis. 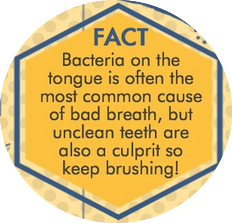 this is because people who suffer from long-term bad breath have accumulated excessive build up on the back of the tongue. Tongue scraping, together with proper oral hygiene is the most effective "common" treatment against the causes of bad breath. Over the counter, mouthwashes are generally ineffective for the treatment of bad breath. If your bad breath persists even after good oral hygiene, there are special products your dentist may prescribe, including Zytex, which is a combination of zinc chloride, thymol and eucalyptus oil that neutralizes the sulfur compounds and helps kills the bacteria that causes them. In addition, a special antimicrobial mouth rinse may be prescribed. An example is a chlorhexidine, but be careful not to use it for more than a few months as it can temporarily stain your teeth. 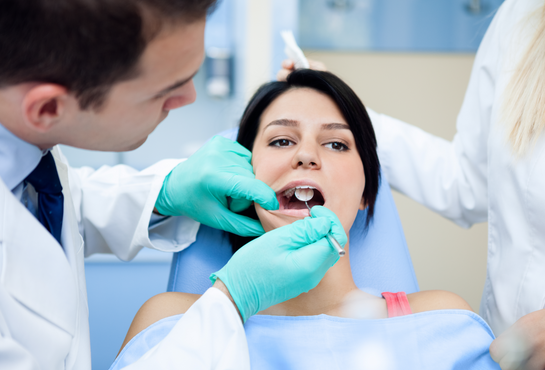 A professional dental cleaning is typically needed to remove the discoloration from tooth surfaces. This prescription mouthwash compound itself has a bad taste. It tends to temporarily alter the sense of taste. Studies suggest that formulations that combine 0.12% chlorhexidine and 0.05% cetyl pyridinium chloride achieved the best results for the treatment of bad breath. Some over the counter antiseptic mouth rinses have been accepted by the American Dental Association for their breath freshening properties and therapeutic benefits in reducing plaque and gingivitis. Instead of simply masking breath odor, these products have been demonstrated to help kill the germs that cause bad breath. Ask your dentist about trying some of these products. Despite whatever advertising you see, you can't expect any type of mouthwash to be an effective cure just on its own. Bad breath is often a symptom of dry mouth -- a condition known as “xerostomia.” Other symptoms of this problem include saliva that seems thick, sores or split skin at the corners of your mouth, and difficulty speaking and swallowing. Most xerostomia is related to medication. More than 400 drugs can affect the salivary glands. These include drugs for urinary incontinence, allergies, high blood pressure, depression, diarrhea and Parkinson's disease. Also, some over-the-counter medications often cause dry mouth. Tobacco, alcohol, drinks with caffeine, snoring and breathing with your mouth open can aggravate dry mouth. There are ways to improve saliva flow. You can also sip water regularly, try over-the-counter saliva substitutes, avoid breathing through your mouth and use a humidifier in your bedroom. If you have dry mouth, you have to pay greater attention to your teeth. Brush your teeth with an extra-soft toothbrush after every meal and at bedtime. If brushing hurts, soften the bristles in warm water. Floss your teeth gently every day.